A task I have been contemplating (dreading?) since day one of this project is the engine mount. Because this plane is the only AA D.VII with an O-200 I am totally on my own when it comes to designing the engine mount, baffling and cowl. I purchased the original C-150 engine mount from the donor plane because it made transporting the engine much easier and I assumed I could use the ring that attaches to the engine bushings. Interfacing this remnant of original mount to the D.VII firewall has been the source of a lot of thought....and anxiety. 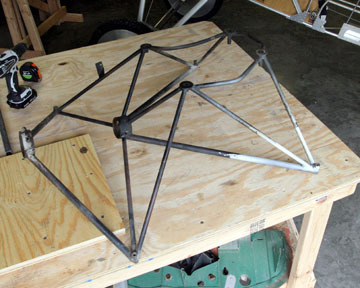 Here is the Cessna 150 mount, circa 1968. It was in good condition but obviously I don't need a nose gear mount. The mount is also too wide for the Fokker fuse. But after careful measurements, it was apparent that when the mount was shortened to the length I need, the width also was decreased due to the geometry of the tubes. Here is the mount after I cut off what wasn't useable. 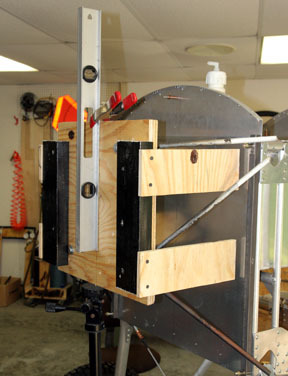 Before cutting, I attached the mount to plywood so the critical engine boss dimensions wouldn't be disturbed. 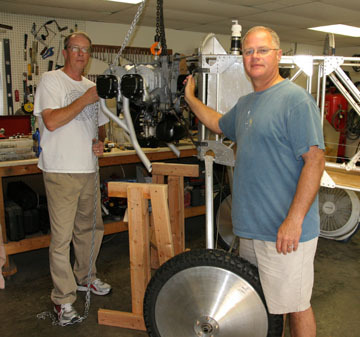 The engine was hoisted onto a temporary stand while the mount dimensions were finalized. The fuse was carefully leveled, the mount will be set with zero down and side thrust. Ply spacers were attached to the mount ply base to space it the correct amount from the firewall and to keep everything square. 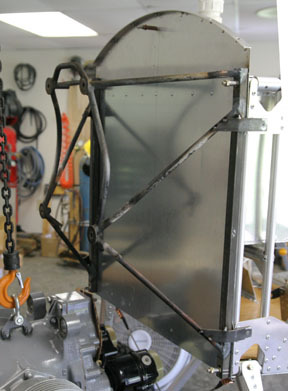 The square steel tubing was cut and drilled so it would attach on the sides of the firewall. I still can't believe how all this is falling into place......the engine is located just where it needs to be to allow removal of accessories from the rear of the case. 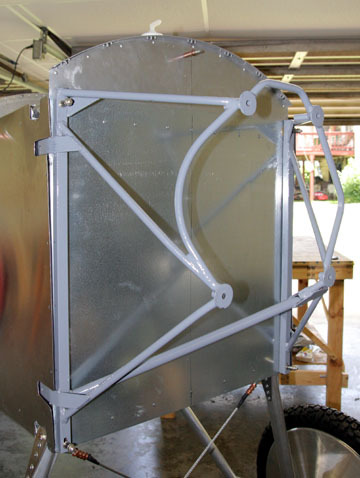 It also ends up just right to fit the oil tank inside the cowl, and provides far more prop clearance than is needed. 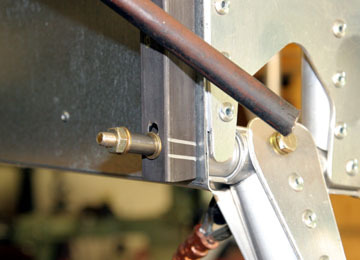 One tricky part of attaching the steel runners is accommodating the bottom fuse bolts due to them not being square to the fuse. They follow the slope of the bottom longeron so the holes must be slotted to get the steel tubes in place. You can see how the Cessna mount tubes land on the square tubing....just right. They will be trimmed as necessary and gussets added to strengthen the joints. I will also add gussets to tie the entire structure into the large gussets on the corners of the fuse. 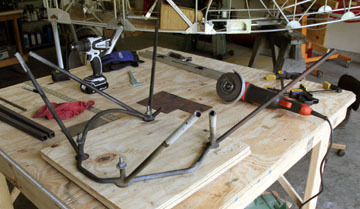 The Cessna tubes were trimmed and welded to the Fokker firewall rails. Straps were fabricated to tie the mount to the large fuse gussets and tacked into place. Time for a trial engine installation. Aviation comrade Greg dropped by to lend a hand and in a few minutes the engine was on the mount.....everything fit! Yes, the O-200 is wider than the D.VII fuse and will require some creative cowling. 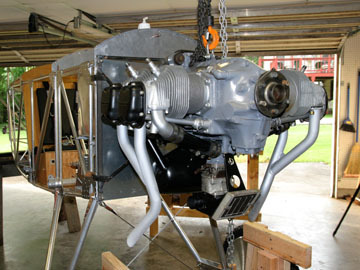 The Aeronca exhaust stacks arrived just before we hung the engine and they look right at home. This is a huge hurdle jumped in the saga of this project. 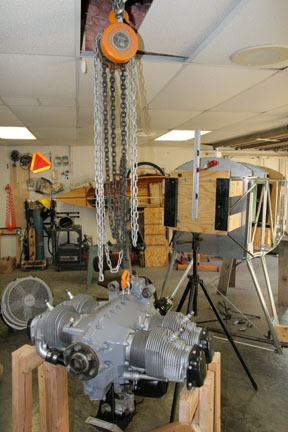 Some finish work needs to be done on the mount and then the engine installation will begin in earnest. Engine mount finished. A diagonal was added to a lower engine boss to prevent lateral motion.